I never knew how valuable life was until I almost lost my little brother. It all started when my brother got sick. I was 9, and he was just 9 months. My mother thought it was an ear infection because he kept grabbing his ear. The first doctor she took him to told her that it was an ear infection. After a week, he was still grabbing his ear. My mother took him to a different doctor for a sec¬ond opinion. They immediately started running blood tests on him. The doctor knew that he needed to be in the hospital as quickly as possible. My mother, father and brother all rode to the hospital in a speeding ambulance. At first the doctors did not know what was wrong with him. Then a couple days later, they found out he had a type of bone-marrow cancer. My mother and father stayed with my brother the first few weeks. Then my mother would stay with my brother while my father would come home and see my sisters and me. 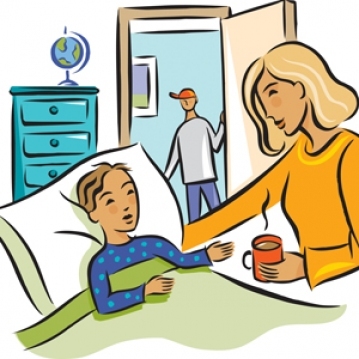 It was hard not seeing my mother all the time, but I did go to the hos¬pital about once a week. The doctors tried one round of chemotherapy. It helped, but my brother lost his hair. Then he needed a bone-marrow transplant. They needed to find a donor, so the doctors tested my family first. I was so scared to get a shot. My sisters and I were all crying. We got it over with quickly, and it did not hurt as much as I thought it would. A couple of weeks later, we found out that one of my sisters and I were both matches. My parents had to choose which one of us should be the donor. After think¬ing about it for a long time, they chose me because I was the oldest. I was excited and scared at the same time, but I knew that I might save his life. My brother was moved to Duke Hospital. It was a unit of about 10 kids who all had a disease. About two weeks later, I went to Duke to do the transplant. The doctors showed me what it was going to be like. I was not scared until the next day, when I had to wake up at 5 a.m. I had to be at the hospital at 6 a.m. When I got there, I had to put on a gown. Then my mother and I went into the oper-ating room with the doctors. They put a mask over my face, and in about 10 seconds I fell asleep. When I woke up, there was a tube stuck into the back of my hand, putting fluid into my body to keep me from getting dehydrated. I immediately wanted to know how my brother was. My mother told me that he was getting my bone marrow right then. About two hours after I woke up, I went to see him. He was asleep, and my father was holding him. All of the bone marrow that I had donated had gone into him. Everybody hoped and prayed that it would work. About a month and a half later, my mother came home. My brother was doing fine. We still had to be careful to not let him get sick with a cold or the flu. He could not be in the sun, either. Also, we had to wear surgical masks when we held him. Now, two years later, he is doing great! He is full of life and is very energetic. He is always doing something. We have to watch him and make sure he does not get too curious! This experience has shown me that all you have to do is believe. You have to believe that the best will happen. Also, you need to be strong no matter what happens. That makes a true hero! Sunrise Sunset A labor of Love or A Happy AccidentThe Grace FactorLady GaGaPat SummittHow Many Miracles do You Get?